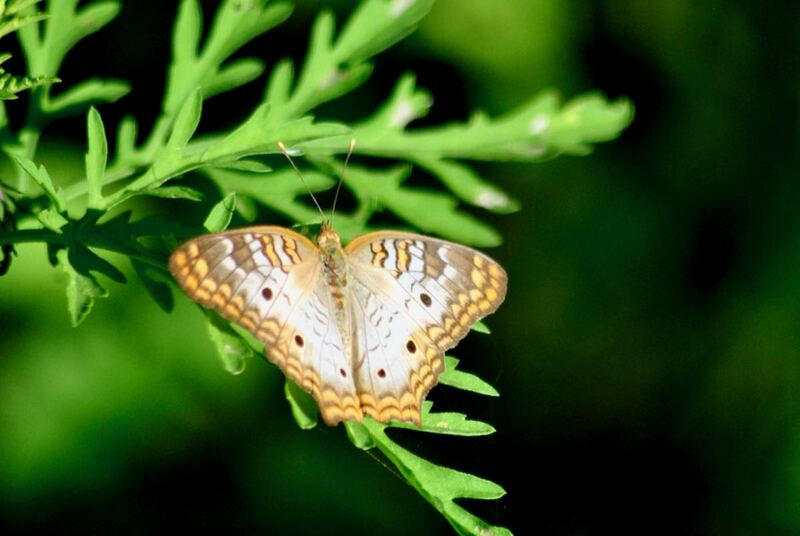 White peacock butterfly, photographed at Leon Weekes Environmental Preserve, Delray Beach, Palm Beach County, in June 2015. 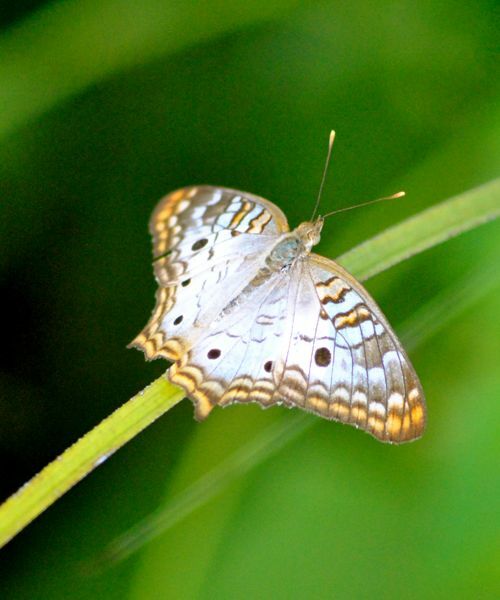 Wander around the wilds of South Florida and you might come to the conclusion that the white peacock, Anartia jatrophae, is the most abundant flying creature in our neck of the woods short of the mosquito. They are everywhere, particularly open, wet places, and in large numbers. White peacock butterflies are southern creatures, more at home where it's warm. Like Florida, particularly South Florida. Its range extends through the southeastern United States through the Caribbean, Mexico, Central America to South America as far as Argentina. In the U.S., their range extends along Gulf and Atlantic coastal plains between Texas and North Carolina. But white peacocks have been known to wander regularly as far north as Wisconsin and New Jersey, with sightings as far north as Massachusetts. They're medium-sized butterflies, with a wingspan going between two and two-and-three-quarters inches. They're easy to identify even during their quick and rather eratic flight patterns, because of their size and color pattern. Both males and females look the same: white peacocks are largely white, as might be guessed from the name, with one large dark spot on each of the forewings and two small dark spots on each of the hind wings. 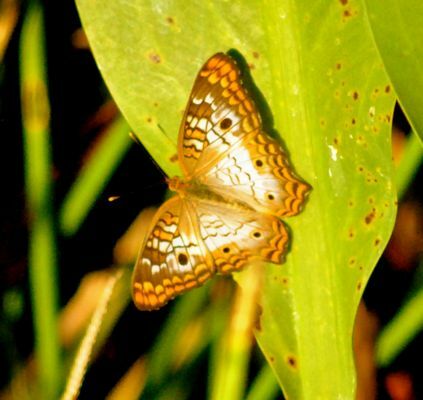 Both fore- and hindwings have a series of brown and orange crescents decorating the outer edges. White peacocks tend to fly low to the ground because their favorite plants tend to be low to the ground. Nectar plants include turkey tangle fogfruit, spanish needles and other members of the daisy family. Favorite host plants include turkey tangle fogfruit and wild petunia. Favorite habitats include roadsides, ditches, parks and fields with weedy, low-lying plants and the edges of ponds, lakes, marshes and canals. White peacock dudes have an unusual strategy for finding lady white peacocks. They'll stake out an area of about 45 to 50 feet in diamater and defend it against all insect intruders, especially other male white peacocks. Thing is, this territory will include a large portion of white peacock hosts plants, because these plants inevitably will attract white peacock females. They'll either perch or patrol while waiting for the love of their lives to come along. Females will lay eggs singly on the ground near the host plants or under the leaves. They're green in color, and will hatch in about three to 10 days and begin chomping on the host plant. It can take about a month from the time the egg is layed until it hatches, develops as a caterpillar and finally metamorphises as an adult. The expected life span of a white peacock: about four months. They are active all year throughout their natural range but restricted to the warmer months when they wander north. Fun taxonomic fact: the species name, jatrophae is Latin for "of Jatropha" but it isn't clear what that's in reference to. There is a genus of plants called Jatropha, but white peacocks don't use them as either host or nectar plant. It could be a place, but that begs the question, what place? White peacock butterflies and members of Nymphalidae, the brush-foot family.